Already certified to PCI 2.x, the MT30 is designed for retailers who place a high value on ease of use, durability, and PCI Compliance. This is a fully featured, customer facing terminal with a color touch screen. The ADA style key pad accommodates the visually impaired. 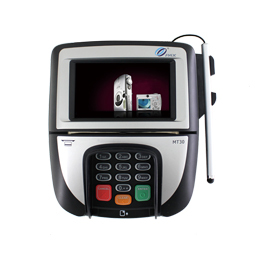 The bi-directional magnetic stripe reader is strategically positioned between the display screen and PIN pad to improve security and usability. The MT30 supports a wide range of cables so that it can easily integrate with virtually any Point of Sale (POS) System.